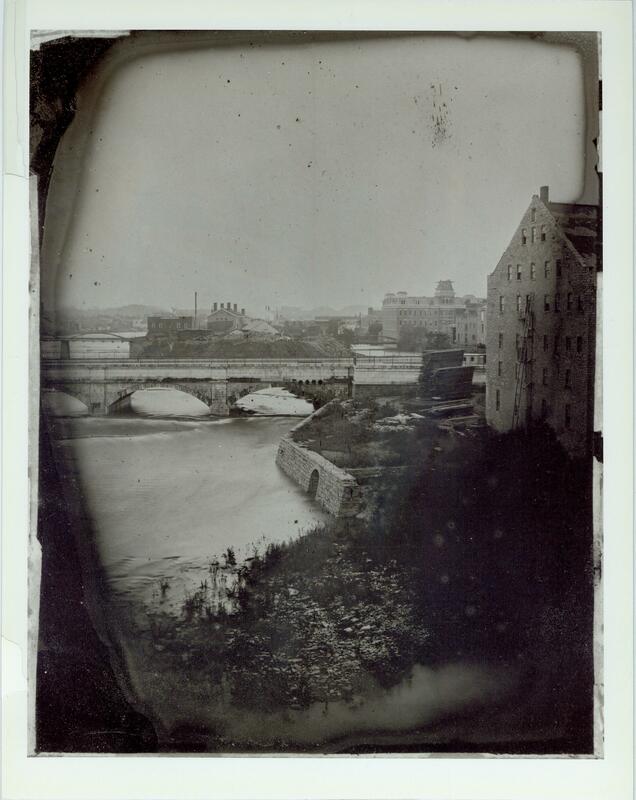 George Eastman was a 23-year-old bank clerk when he caught the photography bug in 1877. While keeping his day job, he began to tinker with camera technology, trying to simplify the complex procedures and bulky apparatus require to take a picture at the time. Negatives were still made on glass plates. Photographers had to coat a plate with a light-sensitive silver nitrate emulsion under a dark drape then quickly slide it into a big, heavy box mounted on a tripod. Eastman’s idea was to make a dry plate that was evenly and thinly coated ahead of time with silver nitrate and gelatine and dried for easy use. He received a patent for a dry coating apparatus (pdf) on April 13th, 1880. Still working out of his home in Rochester, New York, he founded the Eastman Dry-Plate Company. In 1884 he developed another innovation, flexible photographic film (pdf) that could be rolled for compact storage. 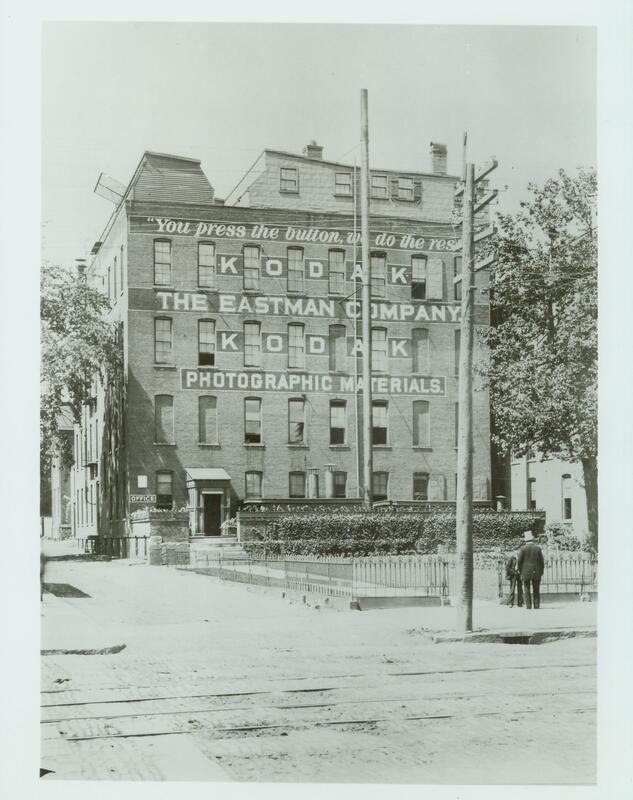 The accordingly renamed the Eastman Dry-Plate and Film Company was soon a full-service camera supply company, selling all manner of photography accessories — squeegees, enlargers, roll holders — in addition to its patented dry plates and photographic film. 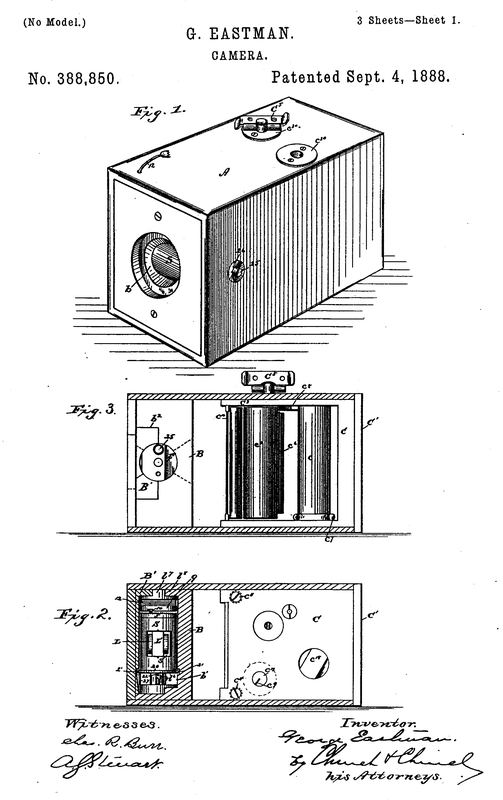 Its greatest breakthrough came in 1888 when George Eastman patented his first camera (pdf). He called it the Kodak, a name he created by moving letters around on a page until he found a combination that looked sharp and couldn’t be mispronounced. This camera was compact, lightweight, portable and so easy to operate anyone could do it, not just professionals or dedicated amateurs. All the operator had to do was pull up a string to arm the shutter, aim at the subject and press a button. The camera was a huge success, particularly with women. Before the Kodak, buyers of photography products were almost entirely professionals. The Kodak Camera made photography accessible to the general population and the general population thanked him by buying his cameras in droves. 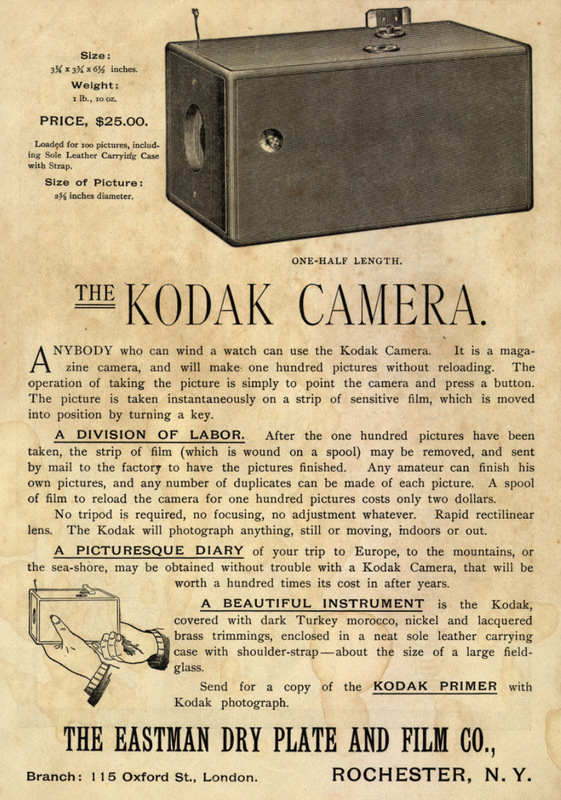 In 1892 George acknowledged the fulcrum of his success by changing the name of the company to the Eastman Kodak Company. Today the George Eastman Museum, formerly housed in George’s Rochester mansion until it outgrew the space, has a vast collection of cameras, photographic materials and films, and is a pioneer in film preservation. The museum recently acquired the only known surviving box of Kodak Film (originally American Film) used in Kodak Camera No. 1, and one of only three boxes known to survive of the 1889 generation of camera film, Kodak Transparent Film. 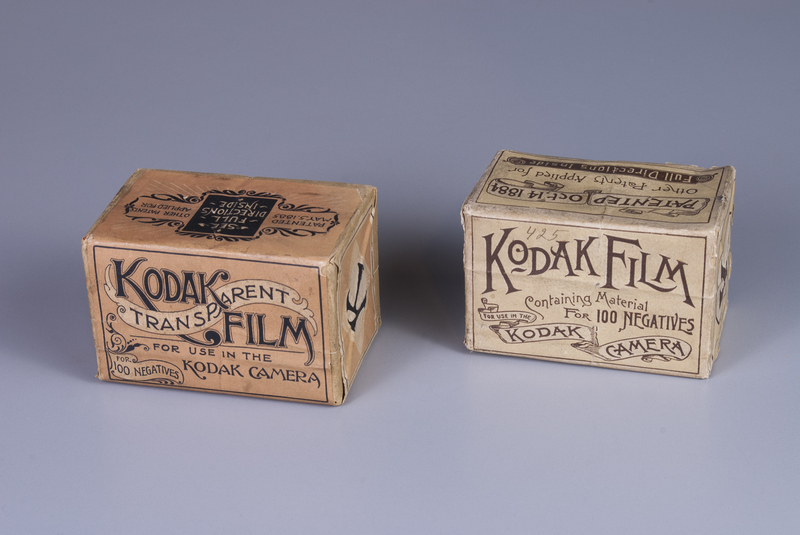 Now a part of the museum’s internationally renowned technology collection, these unopened boxes of film complete the Eastman Museum’s holdings related to the original Kodak camera — adding to its examples of the camera, case, shipping box, and sample images. Eastman’s Transparent Film was the flexible photographic material used by most people experimenting with early motion pictures. 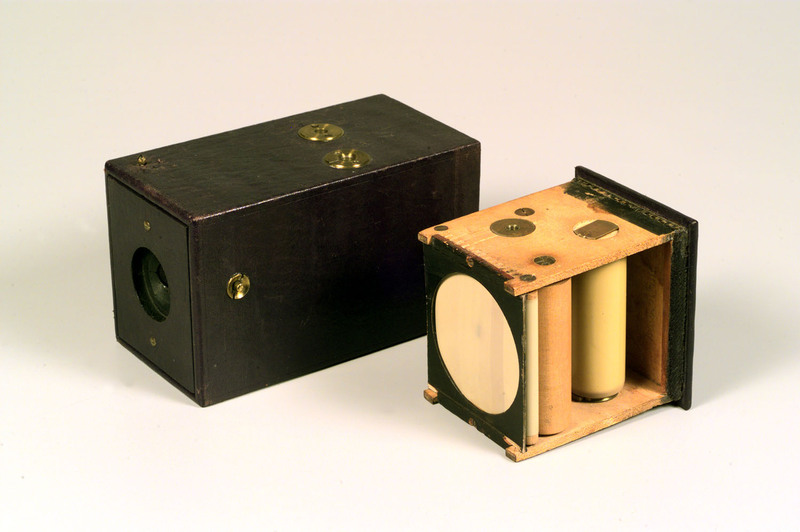 Thomas Edison’s assistant W. K. L. Dickson used Kodak Transparent Film (which was 70 millimeters wide), slit in half to 35mm and then perforated, as the flexible medium to store images to be presented in the Edison Kinetoscope, the first 35mm motion picture viewing device. The acquisition of the rolls was funded in part by the man who is largely responsible for the demise of film — Steven Sasson, inventor of digital photography — and by former Eastman Kodak employee and current author on Kodak Film Robert Shanebrook and his wife Lynne. The newly acquired boxes of film are now on display at the George Eastman Museum. This entry was posted on Thursday, July 14th, 2016 at 1:24 AM	and is filed under Modern(ish), Museums. You can follow any responses to this entry through the RSS 2.0 feed. You can skip to the end and leave a response. Pinging is currently not allowed. OK — so they got the unopened boxes of film — but who had the film and where has it been allllllllllllllll these many years? Some fella with deep-pockets buying it today is not nearly as fascinating as knowing the loooong journey of the film itself. Please, can ya (greedy) give us more info??? A moving video story about (Kodak) slides discovered in the trash.